Gaming is all about passion and reaching new heights. From the day we started our humble company, we worked tirelessly to reach our ultimate goal: Unleash gamers by giving them the best games in one affordable subscription service. 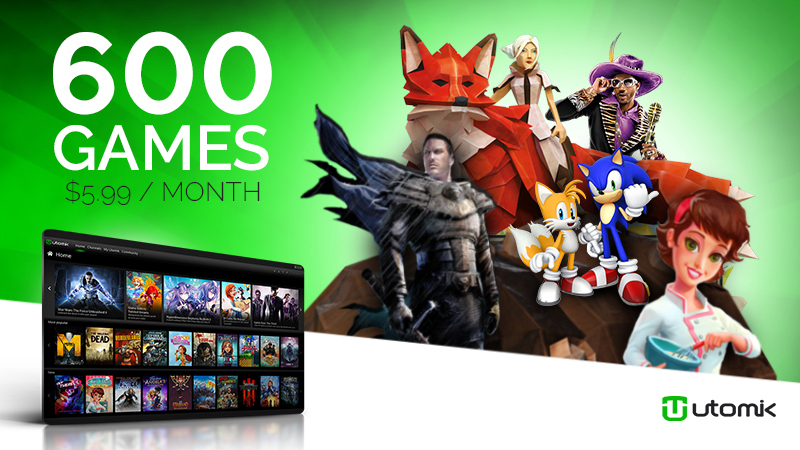 With the superpowers from all our partners combined, we have reached a new industry record: the first gaming subscription with 600 games! Taking one step at a time, we are very proud to have become the best value for money PC game subscription with games from over 60 leading publishers such as Disney, SEGA, Deep Silver and Telltale. “We are proud to set this industry record. This is just the beginning though. We have many exciting announcements lined up for the coming months!” - Doki Tops, CEO Utomik. Utomik brings you a weekly growing library of hand-picked games for only $5.99! Enjoy playing a variety of games? Utomik shines with diversity, discover something new every day. It’s now incredibly easy to play blockbuster classics, retro gems and fresh indie games. With our smart download tech, you play games instantly with the click of a button. Utomik covers a lot of ground, from action and strategy to casual and indie. On top, we go above and beyond to also bring you increasingly new releases. Join the celebration on our Facebook and Twitter!